Many different program options are available for our campers. Please read through our program descriptions to select the appropriate program for your child. Registrations are accepted on a first-serve basis starting February 1, 2018 and are accepted until programs fill. 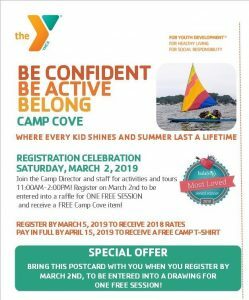 Camp Cove is a 2-week summer camp experience. Two-weeks are essential to create positive group dynamics, teamwork and close friendships with all campers in the group. A camper not attending the full session breaks down the learning process and the experience. Please speak with the Camp Director to see if special accommodations can be arranged. A one-time registration fee of $25 per child and a deposit of $50 per child, per session are required at time of registration. This deposit holds the camper’s spot and will be applied to the full payment of camp fees. The remaining balance must be paid two weeks prior to the start of the scheduled session. Cancellation of a session by a participant at least two full weeks prior to the session will result in a full refund minus the non-refundable registration fee. Cancellations within the two-week period prior to the start of the session will result in a refund, less the $50 deposit and the non-refundable registration fee. No refunds will be given once the session has started. Through generous volunteer support we are able to send children to camp every summer who may not have afforded our programs otherwise. The Ocean Community YMCA offers financial assistance through our Reach Out To Youth campaign for families who qualify. If you need assistance with or have questions about the application please don’t hesitate to contact us. If you would like to donate to Reach Out To Youth please make a pledge on the registration form, through our website, or at the Y.